Are you the type who plans your outfit around your outerwear? Outerwear is the understated, essential piece of a well put together look. Everyone talks about the it bag or the must have shoe, but a statement coat can easily elevate any look from basic to fashionista. A coat or jacket is the finishing piece to your outfit… I would say a great wardrobe would consists of at least 3 different pieces of outerwear per season (even summer). 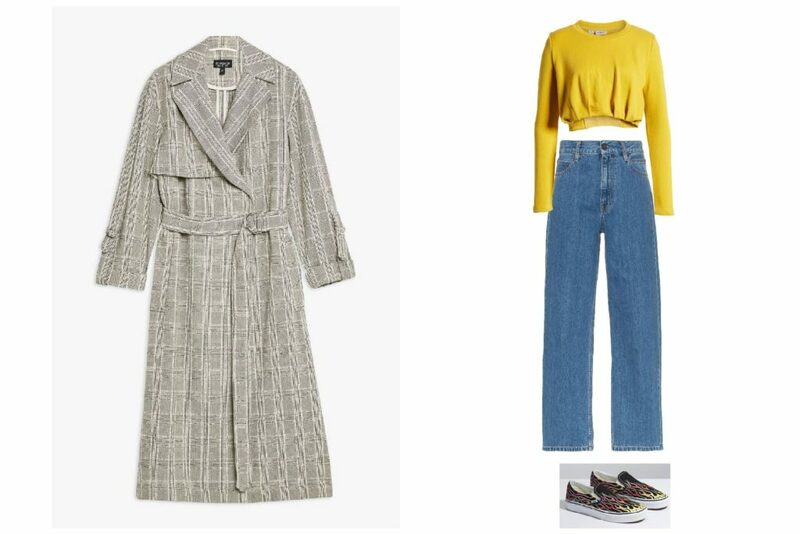 This week’s post will show how one great coat can be versatile and provide you with many styling options throughout this Spring season. We chose a Glen-Plaid, unstructured trench coat from Topshop. The woven plaid fabric gives the coat a little more appeal than your basic camel trench, but it’s not too ornate that it limits your usage or styling. 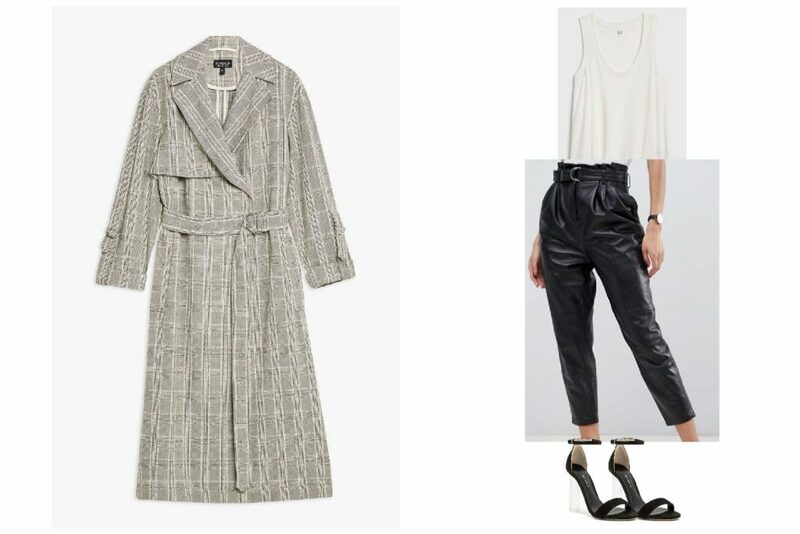 A trench is a great shape because of it’s versatility of being dressed up or down, and with a few exceptions, it works with long or short silhouettes. 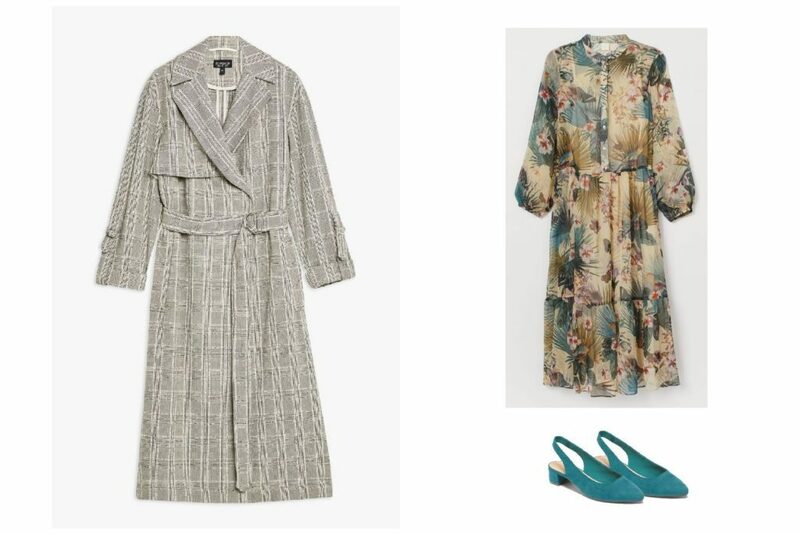 The first look pairs the the coat with a beautiful crepe, floral printed dress from H&M. We love the vintage vibe of this print, almost Asian-Hawaiian with muted earth tones. Mixing prints is no longer a fashion faux-pas. As long as the prints aren’t on the same scale (one should be bigger than the other) and the colors do not clash, it’s almost impossible to mess up. It’s not as intimidating as it sounds; this simple trick can beautifully elevate your look. These two pieces were paired with a simple but colorfully cool, faux suede, teal slingback from Old Navy. Remember when purchasing fun, seasonal purchases, it’s not imperative to buy high end. For the second look, we switched things up… going for a more rock-n-roll look. This time, the trench coat was paired with paper bag waisted, leather pants from Asos. 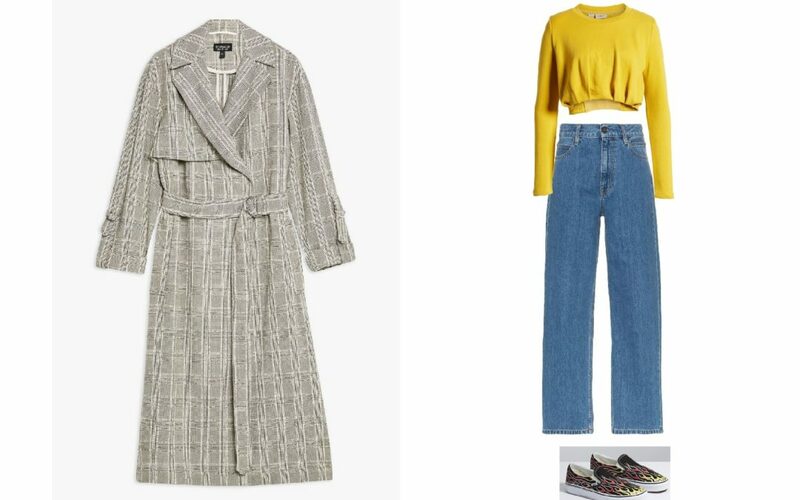 If you don’t mind clicking through a lot of merchandise, Asos is a valuable source for finding great deals. These are real leather pants for $152. The pants are matched with a simple tank from the Gap. Again, stores like the Gap are great for basics and if you shop online, the site is almost always on sale (opposed to the brick and mortar stores). To complete the look, we added a awesome pair of lucite heels from Revolve. For the more fun and daring, we paired the Glen Plaid trench with a bright pink dress available at Nordstrom. This piece is also from Topshop which is the only U.S. retailer to sell the brand outside of the Topshop stores. In the warmer months, I love pairing pink with orange. It creates a fruity, citrusy look which is both fun and sophisticated. These bright orange, peep to mules are from Misguided for only $42. Don’t be afraid to mix n match. It’s no longer the days of head to toe designer; it’s cooler, more fun and most importantly, more practical to do a high-low mix. Finally, we went for a more casual, weekend look with the coat. This time paired with jeans and a yellow cropped sweatshirt. The jeans are from Calvin Klein Jeans and are available at Farfetch. Again mixing high and low, the cropped sweatshirt is $45 and available at Nordstrom. This look was completed with some classic vans with a flame print. Weekend dressing doesn’t have to be leggings or sweatpants. You can easily be just as comfortable and even more chic with minimal effort and some TLC. Fashion should be simple and fun. Be creative with your choices and most importantly, don’t be scared to mix and match pieces in your wardrobe. So many people have looks which they have created and never depart from their self-imposed “Garanimal” labels. Sometimes it’s ok to mix the lion with the giraffe.